A staple in the compact car class, the Kia Forte is known for its legacy of affordability, efficiency, and versatility. 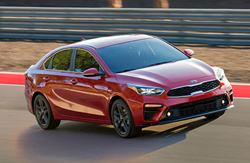 When Kia announced the all-new 2019 model, countless consumers couldn’t wait to see everything that the next-generation Forte had to offer. Available now at Serra Gardendale Kia, the all-new 2019 Forte FE is a part of the limited-time Kia Light Up the Holidays sales event, and many prospective customers are calling this an optimal opportunity to bring one home. The entry-level FE trim of the 2019 Forte is filled with several must-have features and technology systems. Included in every model of the Forte—including the FE trim—curious consumers are sure to appreciate the following features: an eight-inch touchscreen interface, Apple CarPlay™, Android Auto™ and Bluetooth®. Furthermore, all models of the 2019 Forte come with a generous host of standard safety and driver-assistance features, including a rearview camera, lane keeping assist, lane departure warning, forward collision warning and automatic emergency braking. During the Kia Light Up the Holiday sales event, now through Jan. 2, 2019, the all-new 2019 Kia Forte FE can be purchased for as little as $13,999 at Serra Gardendale Kia; please note that additional fees may apply. Again, this model includes all of the aforementioned features. For more information about the 2019 Forte, the sales event or anything else, interested parties are encouraged to call the Serra Gardendale Kia sales team at 205-386-4377. Serra Gardendale Kia is located at 630 Fieldstown Rd and welcomes all visitors. Those who would prefer to explore Serra Gardendale Kia from the comfort of their own home may do so by visiting the dealership online at http://www.serragardendalekia.com.